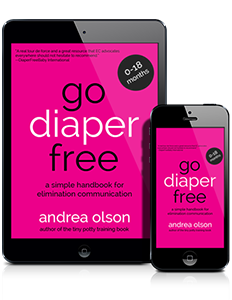 Go Diaper Free is a resource run by me, Andrea Olson, to teach you the beautiful freedom from diapers that you can have with elimination communication...but what is elimination communication? Elimination Communication is a gentle, non-coercive way to respond to a baby’s natural hygiene needs, from as early as birth. 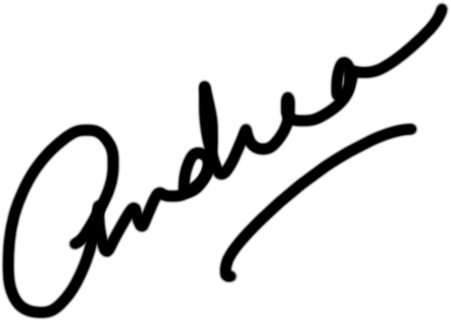 You can learn all about elimination communication on my Getting Started page. Hi! I'm Andrea Olson. I make EC easy. I never really intended on teaching folks about baby potty training, and probably like you, didn't even realize EC existed until my mid-20's, but it has become my passion, career, and motivation. I started EC with my son at birth and was on the search for a resource that could make the subject simple and visual for my placenta-softened-brain to understand how it all worked. I soon got the hang of it and quickly digested all the research and began teaching other moms in mommie yoga how to practice EC too. Soon after, I decided to make a pamphlet on the subject. Being the quadruple-Virgo that I am (ahem), that simple pamphlet quickly turned into a 180+ page book, a library of videos, an audiobook, a series of video minicourses, and a private support forum. Since 2011 I have continued to help thousands of parents worldwide learn about and practice EC with my book and online support. Why is potty learning (from as early as birth) so important? You could say I make it simple for parents to "go diaper free" by graduating from diapers early. I've found and filtered everything on the topic of infant potty training so folks don't get overwhelmed like I was. I simply removed the roadblocks to make things dummy-proof and easier. On a deeper level (I am a psychology/mythology nerd! ), I'm bringing a touch of the sacred to the profane: how we deal with our children's waste, as a culture. Do we bury it (eternally mummified in plastic and gel goo), teach them to ignore their instincts, train our kids to poo and pee on themselves and pretend it isn't there, give them the huge responsibility to train themselves out of something we've trained them into? Do we dishonor the Earth by stuffing Her with poo-filled Pampers? Or...do we honor this natural process, honor our babies' communication and desire for cleanliness, tune in and assist our babies in property disposing of their waste? ...and start using the diaper as a "back-up" instead of a full-time toilet (what an amazing yet tiny shift in this paradigm!). Now back to the practical, physical stuff. I help parents of 0-18 month babies easily and quickly. I've recently begun helping parents potty train their toddlers, too. I have my Master's in Psychology, have worked intensively with kids over the last 10 years, and am both Director of the DiaperFreeBaby organization and Director of the Go Diaper Free Certified Coach Program. You are in good hands. I've helped 1,000's of parents the world over, moms and dads and caregivers alike, start, troubleshoot, and complete EC with a sense of confidence, support, and relative ease. I've helped parents do it part-time and full-time, with daycare and without, in the city and in the country. After years of this intensive work with the diversity of others, I have virtually seen it all. If EC resonates with you and you're just tired of changing diapers, I hope I can help fill in the blanks for you. If you're new here, let's get started with Elimination Communication, shall we? I can give you a great starting point and lead you to where to go to meet your family's specific EC needs. The sky is the limit! Andrea Olson is the proud mama of 5 children - all ECed from birth, all out of diapers by walking - and owner of Go Diaper Free and Tiny Undies. When she started Elimination Communication with her first baby, she struggled with how to actually potty her newborn - where were all the visual, simple instructions...and were there any other parents doing EC? Since then, Andrea has made it super-simple for 100,000s of parents worldwide to start EC with their own babies, as early as birth...and has trained over 300 coaches to host EC communities across the globe. She lives in Asheville, NC, with her husband, kiddos, sweet kitty, and (at last count) 18 backyard chickens.